Hi there, thanks for popping by. Today I have a DT project to share with you. 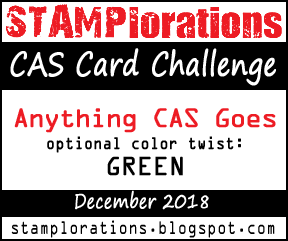 Can you believe it's time for the December CAS card challenge already? I know, right! Where has the year gone? The theme is, Anything CAS goes with the added colour twist of Green. I have put together a Christmas card using a couple of items from my STAMPlorations stash. I chose to make a fair Isle inspired print using green as the main color. I used the Nordic-Knit-Tag stamp set and the Warm-Winter-Wishes die. I can't wait to give this card to a loved one this Christmas.